We are one of the leading manufacturer and suppliers of Stacking & Shrink Wrap Machine. We obligated to meet the quality standards of industrial requirements. Seal Area: 20" X 15"
The concept of web sealing is the most widely accepted concept the world over. It is used for various size packs, heavy in nature and mostly for batch production. Unlike the L - Sealer here the film consumption per pack and hence cost of film per pack is less. This Shrink Packaging Machines aopts infrared radiation in direct heating of PVC/POP Shrinking membrane to achieve optimal contraction packaging.This systemis made reliable by electronic stepless shift and booster in temperature control, which is applied in contraction packaging for food, beverage, candies, stationery, hardware tools, daily necessities and chemical products. 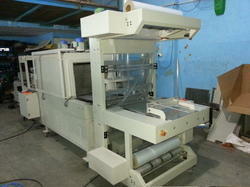 We are engaged in offering a sophisticated range of Shrink Packaging Machine to our valued clients. 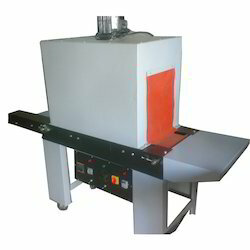 These machines are manufactured using superlative quality mild steel and advanced technology. Our products undergo rigorous quality checks conducted by quality controllers to ensure that these conform to defined standards of industry. - Sealer with shrink Teerminal for currency note bundles size 6"x3"x3"
Our organization offers a range of Shrink Packing Machine that are manufactured from high grade raw material and are used for packing toys, diaries, boots, notebooks, valuable items and pet bottles to improve shelf life. They are available in form of infrared hot air system.